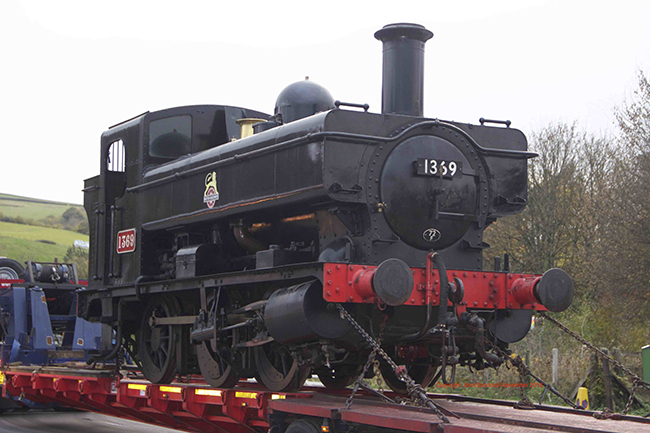 On Monday 14th November 1369 departed for the Christmas season at the Chinnor & Princes Risborough Railway. 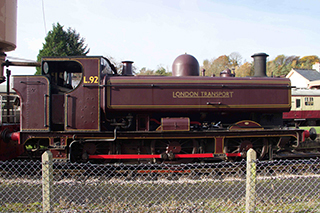 The lorry returned bearing L92, which will need a short visit to our workshops before it operates again. It then departed for the Gloucestershire Warwickshire Railway with Class 24 diesel 5081, which had visited for the diesel gala. 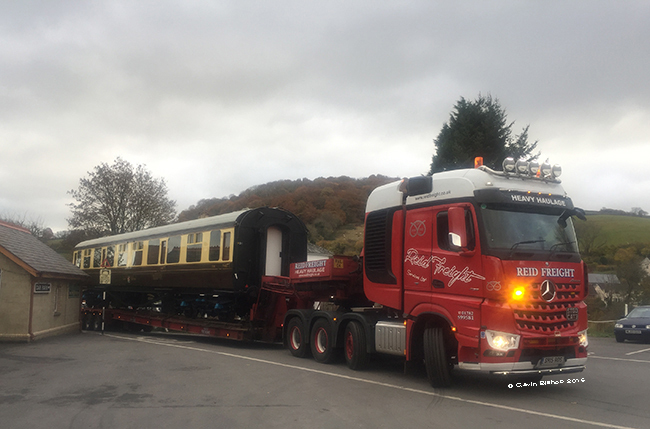 A seperate Reid’s lorry came up from the Plym Valley Railway to take coach No 536 back to the Great Western Society at Didcot. 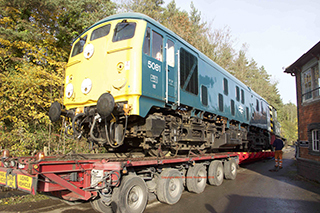 Since the GWS site at Didcot is rail locked without road access the last leg of 536’s journey will have been on national railway metals. Carriage & Wagon has not escaped the ins and outs: BR standard No 4496 has emerged resplendent with a new coat of blood‘n’custard (sorry, plum and spilt milk), and has been replaced by 4785, currently bearing just about every colour that these coaches have ever had. 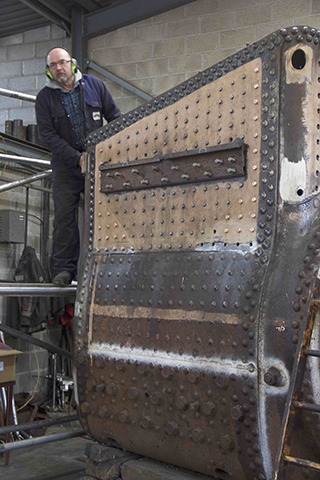 In the workshops 5526’s firebox continues to receive attention, with re–staying continuing apace. Paul Drewett is seen on the job. 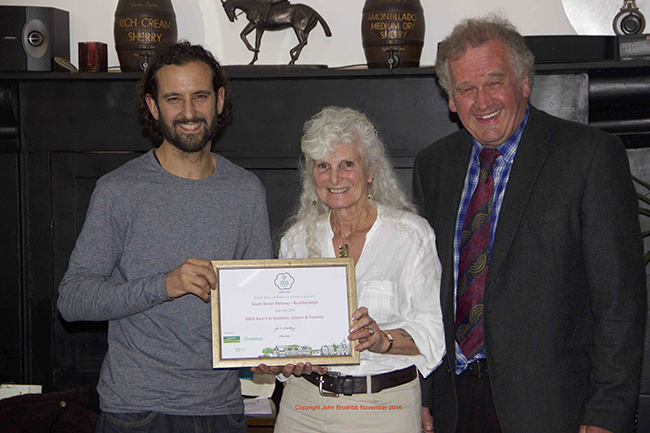 The grounds team, represented by Nick Wakeling and Barbara Parratt, represented the railway at an awards evening in the King’s Arms, Buckfastleigh, on 15 November. Paul Collier, who judged the town in this year’s South West in Bloom awards, presented their certificates for “Outstanding” in the Its Your Neighbourhood section, and the Gold award in the Business, Tourism & Leisure section. Very well done to the whole team. 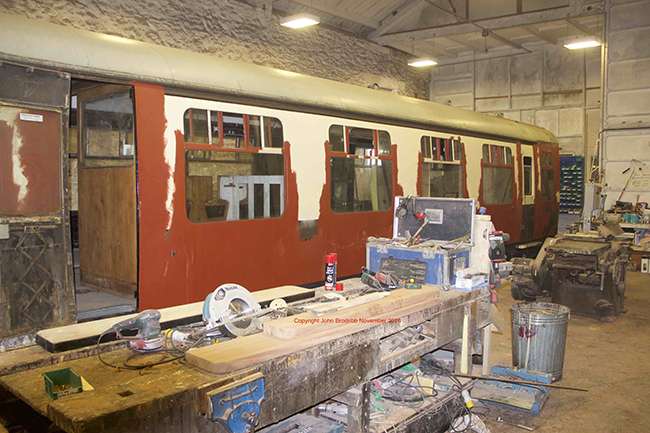 Mike Webb has very kindly sent this picture showing work in progress just on the Totnes side of Napper’s Crossing. SDR personnel involved are Matt Tarrant, Tony Phillips and Paul Watts-Butler; Mike Webb took the photo. The others are from the contractors helping with the work. 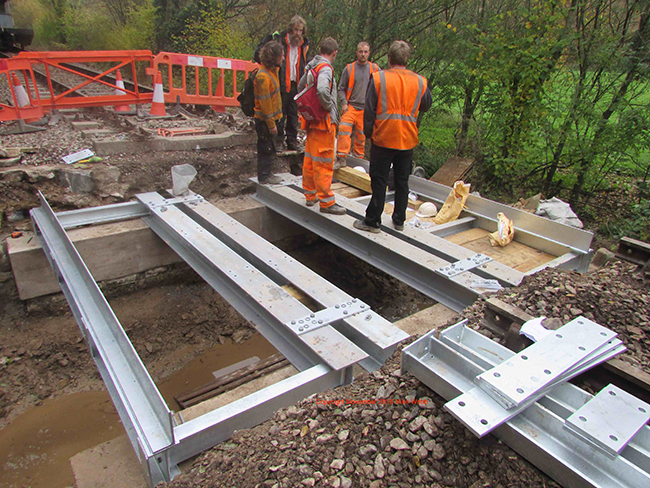 The concrete abutments and girders are in place, and boards to retain the ballast are being installed. Not pictured here: rerailing between Paper Mill and Nursery Pool bridges and the Buckfastleigh station rewire. This is highly controversial, as it means the kettle cannot be boiled for tea for two whole days! Don’t forget next Thursday’s SDRT museum social evening in Buckfastleigh Town Hall: the annual festive season quiz: lots of fun, prizes and cake. 7.00 for 7.30pm, Buckfastleigh Town Hall, Thursday 24 November.